Today's the day!! It's time for the Medallion Magic QAL to start! Yay! Can you tell I'm excited, lol? I have some great prizes lined up so I want to take a minute to thank our wonderful sponsors before we get into the first part of the QAL. Laura at Slice of Pi Quilts is sponsoring winner's choice of any printed pattern (in the US) or PDF pattern (international). Tish at Tish's Adventures in Wonderland is sponsoring copies of her patterns. Now let's get to the quilt! Here's my original version, made in Northcott fabrics. get a copy of the pattern. PDF copies are available through my Etsy or Payhip shops. Printed patterns are also available through my Etsy shop so you can have your pick of formats. share you fabric choices on your blog or on IG (use #medallionmagicQAL) and link up to this post before February 15th for your chance to win. If you don't have a blog and aren't on IG, you can email me a picture to share and I'll include it for you. To make things even more fun, I have some 'getting to know you' questions/fill in the blanks for you to answer when you share your fabrics. You can answer any or all of them, in as much or as little detail as you want 😊 Since it's the people we're sewing with that make the party fun, let's get to know each other better! If I can't be sewing, I want to be _____. What's your favourite meal? I'm bored of all our usual meals, so links to recipes would be greatly appreciated! What's your favourite sweet treat? Again, recipes would be lovely! Do you watch or listen to anything while you sew? What's your favourite technique? Applique? Foundation paper piecing? EPP? FMQ? I've been waiting for weeks to share my fabrics for my new QAL version of Medallion Magic and now I finally can 😊 Aren't they gorgeous? Thank you to Island Batik for sponsoring the fabrics for the QAL! The white fabric is from the Foundations line and it's called Almond. It will be my background instead of the dark brown in the original. I have a hard time wrapping my mind around how completely different the two quilts will look with such different backgrounds. The rest of the fabrics are from the Paisley Park line. 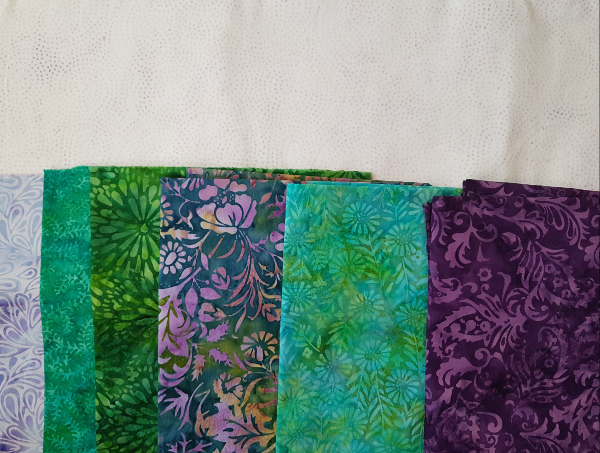 The three to the right will be the main fabrics, with the dark purple replacing the blue and the others in place of the greens. The three fabrics on the left will only be used in small bits in the strip blocks. 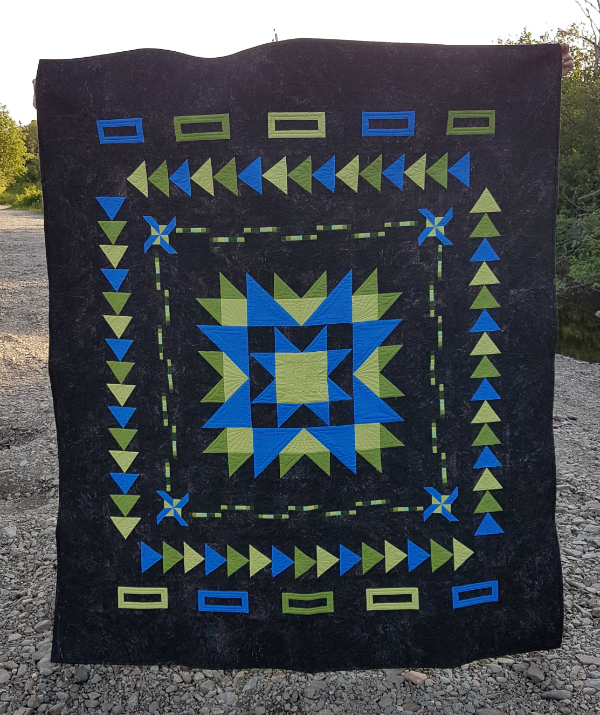 The blues and greens in the original quilt were all solids, so I'm looking forward to making a print version. I've always loved how changing the fabrics can change the look of a quilt pattern and I think this version is going to be beautiful. If I can't be quilting, I want to be outside hiking or snowshoeing, depending on the season. Or maybe snuggled under a quilt reading a good book. Or baking something. Or going for a run. Or playing a game with Paul and the boys. Or walking along a beach...Pretty much anything except cleaning! My favourite meal is spaghetti and meatballs, but I don't use a recipe for either one. The meatballs are ground beef, crushed soda crackers, an egg, steak spice, garlic powder, oregano and grated Parmesan cheese mixed together, rolled into balls and cooked in a frying pan until no longer pink. The sauce is tomato sauce, minced garlic, basil and oregano and sliced mushrooms. Mix it all together in a pot, bring to a boil and then simmer for a couple of hours, with the meatballs in the sauce. Oh, how to choose a favourite sweet? I love so many! I'd have to say it's Cookie Dough Truffles, which I make so much easier by putting the cookie dough mixture in a 9x13 pan, covering with the chocolate and then cutting into bars. They taste the same, but they take sooo much less time. Sometimes I listen to music or to an audiobook while I sew. Sometimes I watch an episode of Gilmore Girls, but I'm on the last season so I'm soon going to need something new to watch. A lot of the time, though, I don't watch or listen to anything, maybe because babysitting toddlers is a loud job and it's nice to have some quiet in the evenings. I love the magic of piecing a quilt top together and I love machine applique, but I think my favourite technique has to be free motion quilting. It's amazing how it can change the look of a quilt top entirely. Plus, it's just a lot of fun! Prizes available this month are patterns from Yvonne at Quilting Jetgirl, patterns from Lorna at Sew Fresh Quilts and patterns from me. The three prizes will be drawn randomly from all those who link up their fabric selections. Remember that if you don't have a blog and you aren't on IG, email me your picture and I'll link it up for you. I can't wait to see what fabrics you choose for your Medallion Magic! Those fabrics are BEAUTIFUL!!!! Can't wait to see the quilts come together! It's a gorgeous design!! I love the colors of your fabric, it's going to be beautiful! What pretty fabrics you're choosing for this one. I think they'll be even prettier than the first one. Oooh...I like your fabric choices. It's going to be interesting to see how it looks in all the different fabric choices. I've got my fabric partially cut -- all the first strip cuts. I'm using some of the fabrics in other projects, so I wanted to make sure I had everything I needed in my project box.